Officials at Muscogee (Creek) Nation today announced the grand opening of the first phase of their historic $365M expansion of River Spirit Casino Resort (formally known as River Spirit Casino). At 5 p.m. on August 25, after an official ribbon cutting ceremony with Muscogee (Creek) Nation, state and local dignitaries, the much-anticipated Margaritaville Casino and Restaurant will open to the public. After breaking ground in 2013, with heavy construction beginning in fall 2014, the Margaritaville Casino & Restaurant complex is the first of four phases of the massive expansion to be completed. In addition to Margaritaville Restaurant & Casino, the first opening includes the new resort grand entry and lobby, 30,000 square feet of meeting space, a Margaritaville Coffee Shop, Margaritaville retail store, resort gift store, new connectivity entrances to the River Spirit Casino, valet parking under the new porte cochere, and an expanded 3,000-space parking facility with a climate-controlled walkway. A 27-story luxury resort tower will open in December 2016, followed by The Paradise Cove theater and Ruth’s Chris Steak House in January 2017, and the LandShark Pool Bar, resort pool deck, outdoor event space and new River Parks Trail opening in Spring 2017. The economic impact over the two-year construction phase is approximately $303.5 million for the region and has created 4,100 unique construction jobs. Currently, more than 650 construction workers continue to work on- site daily. When all openings are complete, the expansion will provide 1,000 new direct jobs and will support an additional 1,200 indirect jobs in the region. According to the Tulsa Regional Chamber, the ongoing regional economic impact is $135.1 million annually. 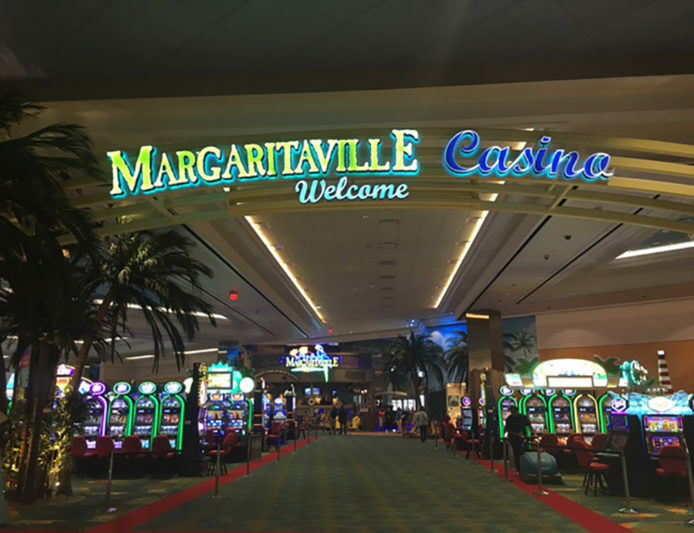 The brightly-lit Margaritaville Casino is 50,000 square feet of island fun with 850 of the latest gaming machines and 27 live table/poker games; connected by portals to the existing casino and hotel lobby. Complementing the casino is Jimmy Buffett’s iconic Margaritaville Restaurant, which features multiple bars on two levels, a flavorful menu of island-inspired dishes and hand-crafted cocktails, weekend live entertainment and a margarita -erupting volcano. The 400-seat restaurant also includes two outdoor decks with spectacular views of the Arkansas River. “This particular development marks the largest restaurant and casino complex within our portfolio, and we are excited to bring all the fun and escapism of Margaritaville to the banks of the Arkansas River and the Tulsa community,” said John Cohlan, chief executive officer of Margaritaville. Enhancements to the existing casino were also made, including a complete re-facing of the current exterior to complement and integrate with the expansion areas, as well as new signage, and a complete remodel of the Visions buffet. Since the groundbreaking, other completed project milestones include: the addition of Johnny Rockets inside the existing casino, the newly remodeled Scoreboard, River Spirit’s sports bar that features 22 flat-screen televisions (includes a 102-inch plasma television) and the opening of Jimmy Buffett’s 5 o’Clock Somewhere Bar at River Spirit last summer. The most recent addition was the remodel of Elements Steakhouse into Fireside Grill, an upscale grill featuring gourmet takes on American cuisine in a contemporary setting. The 27-story resort and convention center, slated to open in December, will feature 483 guest rooms, including 54 suites, and the upscale spa resort. The convention / meeting venue will include 30,000 square feet of meeting space, including a ballroom and a pre-function area overlooking the pool deck and casino. Project partners in construction include Manhattan Red Stone and Program Management Group, Native.